Fire and smoke rise off the northbound side of the U.S. 101 freeway in La Conchita, Ventura County. 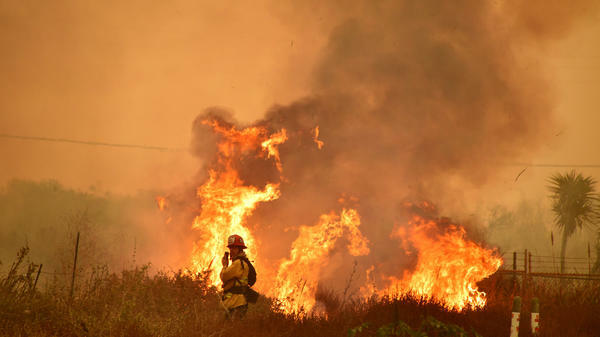 It is day four of the wildfires that are burning through parts of Southern California. Strong winds have made it hard for firefighters to make much progress. And these fires come less than two months after ones in Northern California. Those fires burned down thousands of homes and killed more than 40 people. Climate experts say this could be the new normal for the state where wildfires now happen year-round. NPR's Kirk Siegler reports. KIRK SIEGLER, BYLINE: Neil Fazzari is wiping a thick layer of ash off the windshield of his SUV. He and his wife, Kirsten, take off their smoke masks to point up at their street where they evacuated. NEIL FAZZARI: Right here. We're on this street. SIEGLER: Their neighborhood in LA's Sepulveda Pass, a brush-covered canyon on the city's western edge, is adjacent to the nation's busiest freeway and just below the famous Getty Museum. It's now dense with smoke. K. FAZZARI: It was a shock this morning when our neighbors knocked on our door. SIEGLER: The Fazzaris were stunned to see such a large wildfire this late in the year. SIEGLER: The immediate culprit of the five major fires burning in Southern Cal right now is the Santa Ana winds, the hurricane-force gusts that blow off the Mojave Desert igniting infernos from toppled power lines or carelessly tossed cigarette butts. Now, it's not unusual to get Santa Anas this late. It's just that by now, the rainy season should have started. In an interview on Skype, UCLA climate scientist Daniel Swain says nothing can be considered typical anymore. DANIEL SWAIN: This year, we experienced a record warmest summer and, in some places, record temperatures in the autumn as well. SIEGLER: There's also a high-pressure ridge stuck out over the Pacific that's blocking storms. Swain's research is showing that these high-pressure systems are growing in frequency as a result of the warming ocean, one reason California is getting hotter and drier with drier brush and longer fire seasons. SWAIN: It's starting to appear that the likelihood of seeing these sorts of events is increasing. SIEGLER: The open question now is how long this high-pressure ridge sits. If it's more than just a few weeks, much of Southern California could fall back into extreme drought. Drought and wildfires are a fixture of daily life here, though, especially in Los Angeles, with its chaparral-covered canyons and open spaces between hilly neighborhoods. SIEGLER: Fire agencies here are considered some of the best in the world at knocking down urban brush and wildland fires before they consume neighborhoods. But in extraordinary conditions like these with the fires burning so erratically, it's not even safe for firefighters to try and protect homes at times, let alone try and contain the flames. That's why you hear LA Fire Chief Ralph Terrazas constantly pleading with the public to pack go bags and heed all evacuation warnings. CHIEF RALPH TERRAZAS: The people in this area and all areas of the city that have a brush fire threat need to continually monitor the media. SIEGLER: Last night, millions of cellphones buzzed across LA County with an emergency alert warning of extreme fire danger. This new norm is unsettling for people like the Fazzaris, who moved here from New York a few years ago. Now, they too were prepared and ready to leave, but Neil says he's second-guessing living in a place where you have to have an emergency kit packed at all times, be it for fires, floods, earthquakes. N. FAZZARI: And I don't really care for that. I don't like that so much, you know - kind of over the wildfire thing, to be quite honest. SIEGLER: Kirk Siegler, NPR News, Los Angeles. Transcript provided by NPR, Copyright NPR.